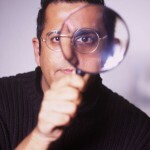 Simon Singh achieves the impossible and makes maths interesting for the numerically challenged. Oh dear. En route to Simon Singh’s mews home, my pit-of-stomach dread of maths – fractions, long division, impenetrable formulae – resurfaces. This is an old, primal fear and not Singh’s fault. He has done his utmost to soothe the nerves of maths-haters (arithmo-phobes?) like myself. His new Radio 4 show, Another Five Numbers, is a lively series of 15-minute journeys around numbers and their social and scientific history and significance – four, for example, is the only number with the same number of letters as the number itself, but also, apparently, the least colours you need to draw a map without the neighbouring countries sharing the same hue. Singh, a bear of a man dressed in retro Hawaiian shirt and boffin-issue circular specs, is a zealous advocate for maths and science. His first book, Fermat’s Last Theorem, (1997) was an international bestseller, shifting 200,000 paperback copies in Britain alone. It told the amazing story of how a Princeton academic, Andrew Wiles, finally proved the 17th-century mathematician Pierre de Fermat’s 300-year-old theorem – that while the square of a number can be broken down into two other numbers squared, the same is not true of cubes, or any higher power. Besides the number crunching, this was also a brilliant drama, starting with Fermat’s tantalising jotting next to his theory: “I have a truly marvellous demonstration of this proposition which this margin is too narrow to contain.” With considerable verve, Singh charted how generations of ambitious thinkers had resorted to theft, transvestism, even duelling, in their efforts to prove Fermat’s theorem. His father, meanwhile, showed him “how things worked.” He jumps up from the sofa and returns with something his father made, a “dozel”, a little stick with grooves on it with a mini-windmill on its tip. He uses a second stick to rub against it, and on my say-so (the magic word is “hooey”), the windmill goes into reverse. This isn’t magic, apparently – it’s simply a question of where you position your fingers. As a boy, Singh was transfixed by TV scientists such as Magnus Pyke and Heinz Wolff exclaiming vividly over “videos of what the Universe was like, why the sky is blue, why you shut your eyes when you sneeze”. After A levels in mathmatics, physics and chemistry, Singh studied physics at Imperial College, London, then for a PhD in particle physics at Cambridge and at the European Centre for Particle Physics in Geneva. It was there, aged 26, that he decided to leave academia. IN 1990 he joined the BBC and for six years made films for Horizon and Tomorrow’s World. He was approached to direct a film about Fermat while considering a career change; it was a huge success, winning a Bafta, and Singh wrote a book telling the whole story. He watched with mounting incredulity its rise “from eight to five to three then one” in the book charts. Singh is a man with a mission. Disgusted at the lack of qualified teachers in many schools, he is overseeing a scheme placing maths and science graduates in schools to teach “and act as role models and inspiration” to pupils. “Most importantly, our lives are increasingly influenced by scientific and technological issues. In an age when there will be difficult decisions to be made about issues like cloning and stem cells, we need to be informed. Otherwise, as a society, we’ll make stupid decisions.” He is angry that parents rejected the majority scientific view of the MMR jab – that it was safe. But he can’t be surprised, I say, that there is a mistrust of science given its perceived loftiness and abuses. IS it all work with Singh? His living-room is essentially an office, with few personal possessions. Shelves are stacked with box files, books for research and the odd video ( The Office, Scream, Alan Partridge ). He is, he says, socially phobic, turning down invitations to parties and only comfortable one-on-one with close friends. Yes, he assents, that is odd considering how comfortable he is on stage or in front of the camera. He pulls out a plastic “witch stick”, resembling a mini fluorescent banana. He spins it in one direction, then notes that it won’t spin in the other. With the revelation that the great Simon Singh can’t work out how a little plastic thing rotates, my pit-of-stomach dread of maths and science lifts considerably.